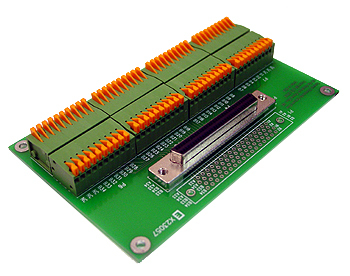 Any PMC I/O board can be used on PCI Express, PCI-X, cPCI-X, PCI, cPCI, PC-104-Plus via an adapter. Don't forget to order a cable for the adapter if you are ordering an adapter with Rear I/O! View the spec sheet for the XMC / PMC Carrier. Adapts a single-width PMC form factor to a one-lane PCI Express (x1 link) PCI/104-Express stack. View the spec sheet for the PCIe104x1 to PMC Adapter. The DC/DC converter eliminates the need for an external power supply connector. Our PCI express adapters are software transparent; however, if you purchase the adapter and the PMC card on the same PO, we will plug them together and re-test the entire assembly. View the spec sheet for the PCIe4-to-PMC-Adapter. 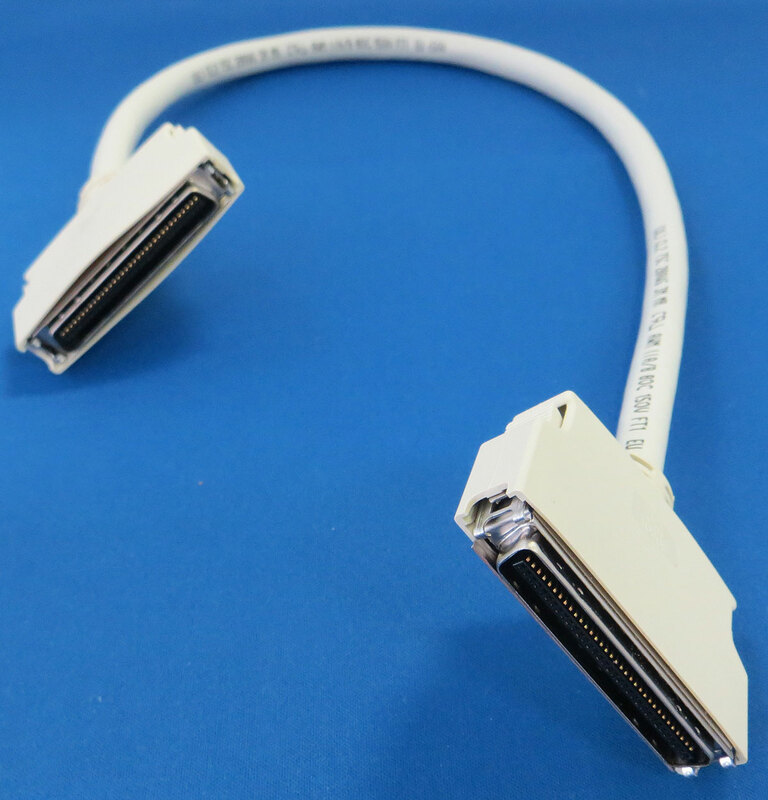 Identical to our PCIe4 to PMC Adapter except for new SCSI3 connector which provides PMC rear I/O connection. View the spec sheet for the PCIe4-to-PMC-SCSI3-Adapter. View the spec sheet for the PCIe1-to-PMC-Adapter. The PMC-to-PCI Adapter accommodates one PMC Card to a 64 bit PCI environment. The PMC-to-PCI Adapter accommodates one PMC Card to a 32 PCI environment. 64Bit PCI-X Bus to 64Bit PMC Adapter on a PCI card (short length). Operates with any combination of 64Bit or 32Bit PMC cards in 64Bit or 32Bit PCI-X Bus. View the user manual for the PMC-to-PCIX Adapter. The CPCI-TO-PMC ADAPTER accommodates one PMC Card to a CPCI environment. Refer to the user manual of the board for configuration of the PXI inputs. 64Bit CPCI-X Bus to 64Bit PMC Adapter on 3U card. Operates with any combination of 64Bit or 32Bit PMC cards in 64Bit or 32Bit CPCI-X Bus. View the user manual for the PMC-to-CPCIX Adapter. View the spec sheet for the cPCIe4-to-PMC-Adapter. The PMC-to-PC/104-Plus Adapter accommodates one PMC Card to a PC/104-Plus environment. adapter to be configured as device 0-4.
designed “PMC-to-PC/104-Plus Adapter” and also includes RIO (Rear I/O). allows the adapter to be configured as device 0-4. The PC104P-SPACER is designed to allow an additional amount of distance to be placed between two PC/104-Plus modules with minimum effort. The PC104P-SPACER contains two stack-through connectors (ISA and PCI); it contains no active circuitry. 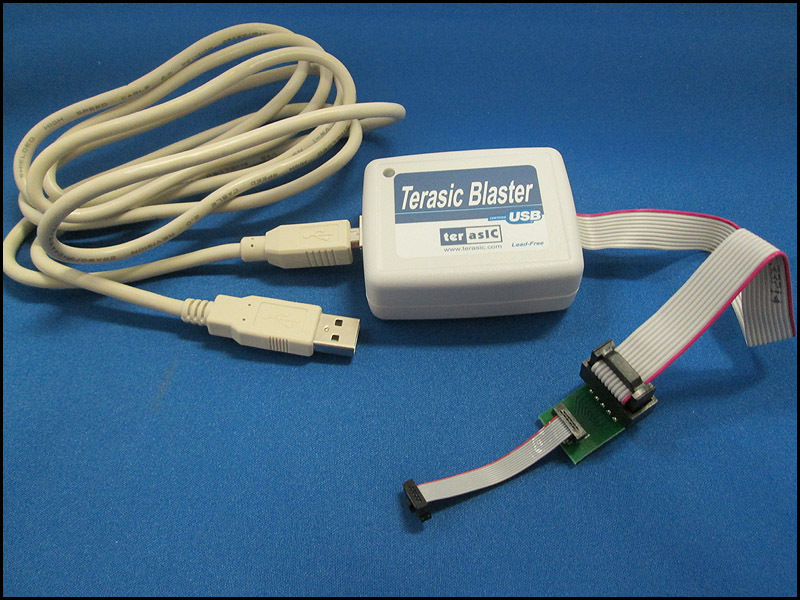 This product is typically necessary when our “PMC-to-PC/104-Plus Adapter” is used with a PC104 (ISA only) module for an application. This PC104P-SPACER is typically not needed if the ISA connector is not being used. Our “PMC-to-PC/104-Plus Adapter RIO180” can solve component interference problems in most cases. Contact factory if you have any questions regarding the use of this spacer. The PCI104-Express SPACER is designed to allow an additional amount of distance to be placed between two PCIe104 modules with minimum effort. The PCI104-Express SPACER contains one stack-through PCIe104 and PCI connector. This product is typically necessary when our "PC104P to PMC Adapter" or "PCIe104 to PMC Adapter" is used. Contact factory if you have any questions regarding the use of this spacer. 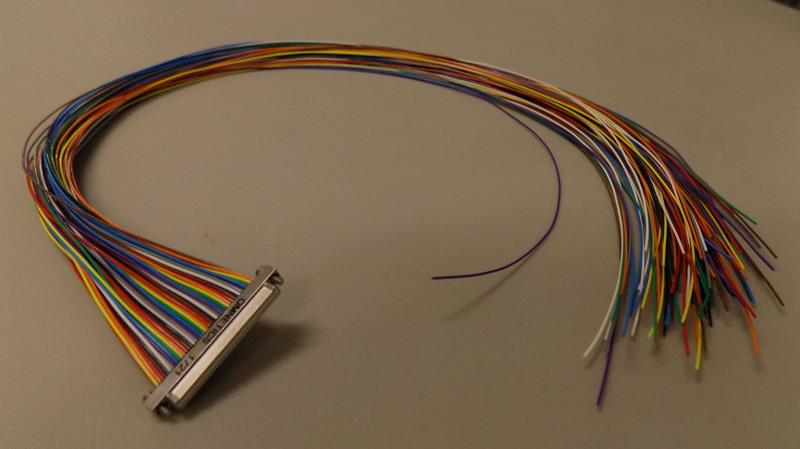 View an image of the Download Cable for FPGA. $145 for CABLE-DLOAD-FPGA-USB; download cable for Altera Cyclone II; download via computer USB port. 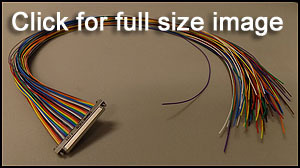 View an image of the 68-pin MDR Cable. Cable part numbers for boards are: CABLExSH-NNN, where x = length in feet and NNN is the model number of the board. $795.00 each for cables up to 12ft long, x= length in feet, in multiples of 1.5 ft; add $10 per foot for cable lengths over 12 feet. The price of the Trigger Cable is $95 each and uses the same connector on both ends. View an image of the trigger cable. add $50 to the cost of the cable and add "-ROHS" to the end of the part number. CABLEx-NNN, where x = length in feet, in multiples of 1.5 ft and NNN is the model number of the board. $195 is the price for all cables with connectors on both ends, up to 12 feet long; add $10 per foot for cable lengths over 12 feet. For example: The part number for a 9 foot cable for the PMC-ADADIO board would be CABLE9-PMC-ADADIO. Please Note: if you require a metal backshell, please add -BACKSHELL to the part number and an additional $100 to the total cost. CABLEx-NNN-FLAT, where x = length in feet, in multiples of 1.5 ft and NNN is the model number of the board. $95 is the price for all cables with a connector on one end, up to 12 feet long; add $10 per foot for cable lengths over 12 feet. 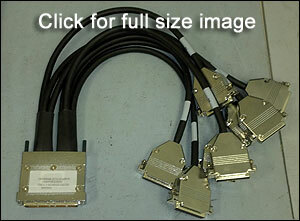 For example: The part number for a 9 foot FLAT cable for the PMC-ADADIO board would be CABLE9-PMC-ADADIO-FLAT. Cable part numbers for Shielded Cable are: CABLExSH-NNN, where x = length in feet; Add "SH" after the length and NNN is the model number of the board. Please specify if you would like wires attached. Add W0 at the end of the model number if you do not need any wires attached. Shielded cables are $295 each up to 12ft, add $6.00 for each additional foot for cable lengths over 12 feet. 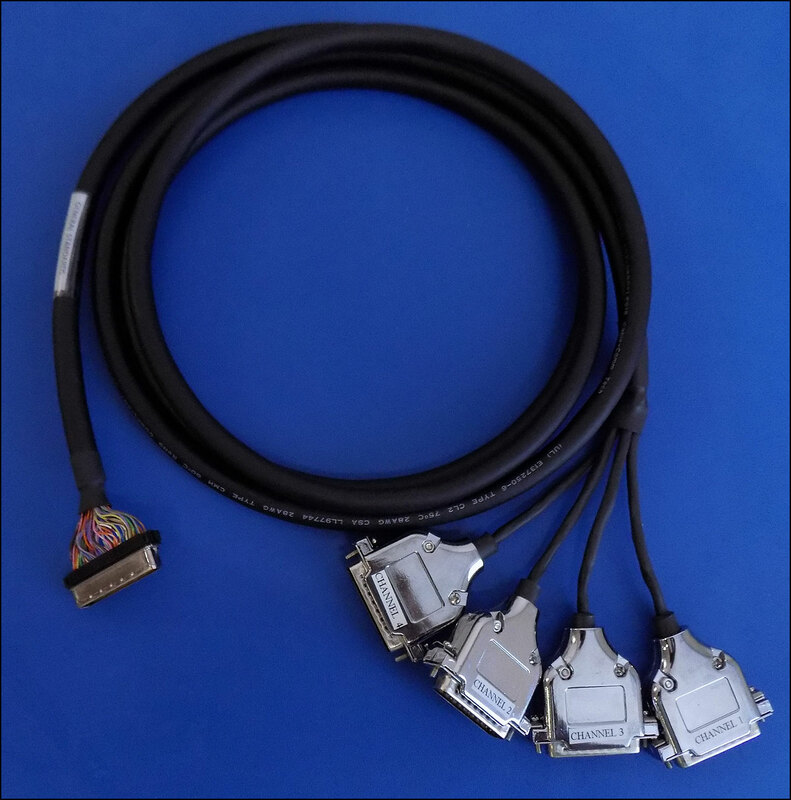 $295 each for the CABLE6SH-PCI-16SDI-HS-08-DB50-W2, for a 6 ft shielded cable with DB50 connectors on both ends and a wire attached to both ends. Cables for the following model boards are with 68-pin AMP mating connector. For cable with compatible connector on both end, cable part numbers are: CABLEx-NNN, where x = length in feet, in multiples of 1.5 ft and NNN is the model number of the board. $295 is the price for all cables with 68 Pin AMP connectors on both ends, up to 12 feet long; add $10 per foot for cable lengths over 12 feet. For example: The part number for a 9 foot cable for the PMC-ADADIO board would be CABLE9-PMC-ADADIO. Serial Cables with 68-pin AMP mating connector are non-shielded. For Cables with 68 Pin AMP connectors if Shielded Cable is required add "SH" to the part number after the length specified and an additional $100 to the total cost. The Cable part numbers for Shielded Cables are: CABLExSH-NNN, where x = length in feet; add "SH" after the length and NNN is the model number of the board. Please specify if you would like wires attached. Add W2 at the end of the model number if you need a wire attached to both ends (3 inches). * *Stranded wire, 22 AWG. Please note for METAL AMP backshell, please add "-BACKSHELL" to the part number and an additional $100 to the total cost. For cable with compatible connector on one end and no connector on the other end, add -FLAT after the part number. CABLEx-NNN-FLAT where x = length in feet, in multiples of 1.5 ft and NNN is the model number of the board. $195 is the price for all cables with a 68-PIN AMP connector on one end, up to 12 feet long; add $10 per foot for cable lengths over 12 feet. For example, the part number for a 9-foot with connector on one end cable for the PMC-ADADIO board would be CABLE9-PMC-ADADIO-FLAT. If METAL AMP backshell, please add “-BACKSHELL” to the part number and an additional $100 to the total cost. Cables for SIO4* boards have a special numbering system. Serial Cables with 68-pin AMP mating connector are non-shielded with heat shrink wrapped ends. For cable with board mating connector on both end, see both ended pricing above. For Metal Backshell, please add “-BACKSHELL” to the part number and an additional $100 to the total cost. Cables for the legacy SIO4 products can be found at the bottom of this section. * $295 is the price for serial IO cables up to 12 feet long. Please add $10 per foot for cable lengths over 12 feet. x = length in feet in multiples of 1.5 feet. For cable documentation for the CABLEx-SIO4B-STD3 family, CLICK HERE. For cable documentation for the CABLEx-SIO4B-STD3-DB25x-RS530 family, CLICK HERE. This cable is suitable for asynchronous protocols where only data connections are needed (no clock). This cable is not suitable for -SYNC versions of the serial cards. For cable documentation for the CABLEx-SIO4B-STD1-DB9x family, CLICK HERE. This cable is suitable for synchronous protocols (HDLC, Isochronous, etc) where a separate clock and data are needed. This cable is suitable for the -SYNC version of the serial cards only if used in two-signal mode (clock and data only). For cable documentation for the CABLEx-SIO4B-STD2-DB9x family, CLICK HERE. $195 is the price for all cables with a connector on one end, up to 12 feet long; add $10 per foot for cable lengths over 12 feet. RS530 cables are available with two different pin-outs. The pin-out for the two versions of the cables are identical, except for the -REV version has the polarity of the differential signals reversed. For lengths over 12ft, please contact the factory. For cable documentation for the CBLx-SIO8BXS-DB25x-RS530A family, CLICK HERE. For cable documentation for the CBLx-SIO8BXS-DB25x-RS530A-REV family, CLICK HERE. For cable documentation for the CBLx-SIO8BXS-STD3-DB25x family, CLICK HERE. For cable documentation for the CBLx-SIO8BXS-STD2-DB9x family, CLICK HERE. * The $195 is the price for serial IO cables, up to 12 feet long; add $10 per foot for cable lengths over 12 feet. For cable documentation for the CABLEx-SIO4-STD2-DB25 family, CLICK HERE. For cable documentation for the CABLEx-SIO4-STD232C-DB25 family, CLICK HERE. Cable part numbers for cables with BNC connectors are CABLEX-NNN-BNC-PP. PP is the number of signals. Please inform GSC what signals you need BNC connectors for before placing an order. up to 12 feet long; add $10 per foot for cable lengths over 12 feet. 12 feet long; add $10 per foot for cable lengths over 12 feet. Cables with BNC connectors for 65+ channels, up to 12 feet long, are considered custom cables. Note: Contact factory if BNC connectors are needed for digital I/O channels or multi-board synchronization channels. User can specify a special connection diagram used to build the cables. Customers will need to provide a wiring diagram to receive pricing and a special part number. Stocked lengths are TBD at time of purchase. Instead of a connector part number, simply provide this description: "cable connector compatible with 'board model number'." NOTE: High density connectors are often hard to obtain in quantity less than 200, so we stock them and sell in unit quantity as a service to our customers. 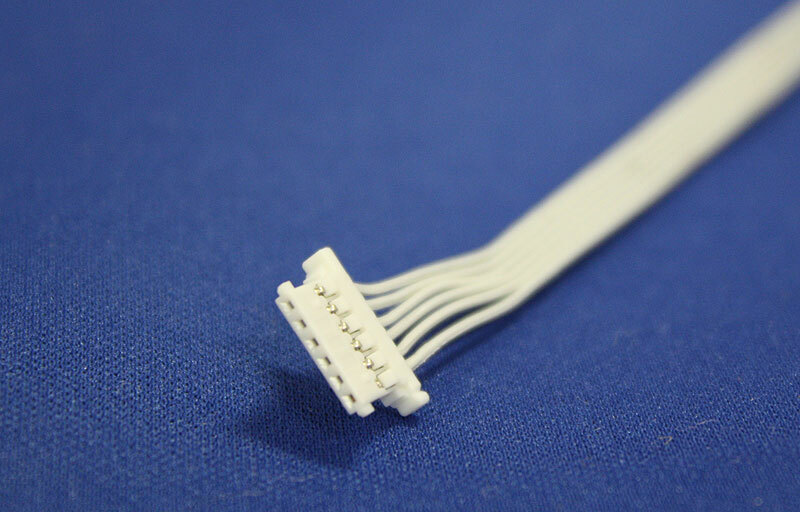 Note: Most connectors are high density types and require special tooling to attach to a cable. Thus, it is recommended that a customer purchase cables from GSC, at least cable with a connector on one end. The twist-n-flat cable used is standard mil spacing and will mate with most traditional flat cable connectors. Simply specify what board they are to mate with. Connectors are $20.00 each. Compact and reliable transitions between high density connectors and high quality spring loaded terminal blocks. 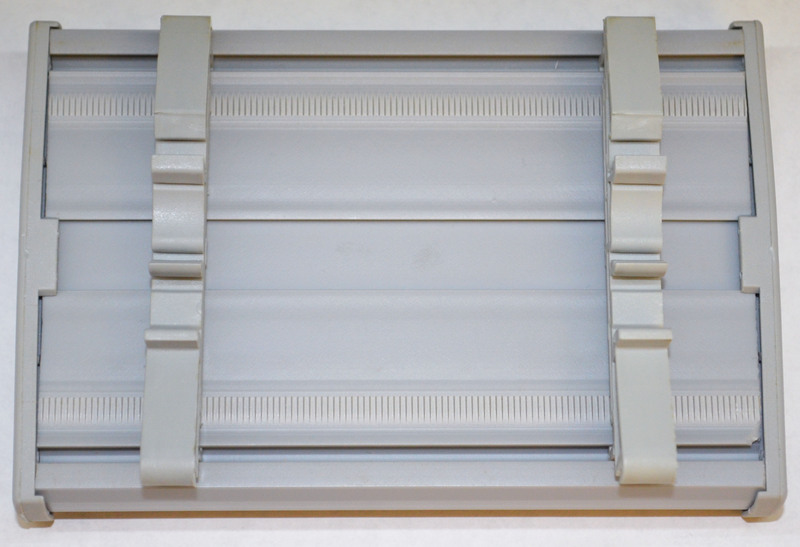 Modules are 2.88" in width (length varies depending on part number) so they can be mounted in standard DIN rail fixtures. Terminal blocks accept 18 - 26 AWG wire. Cable Interface Module part numbers are: CBLIFMOD-X, where x is the model number of the board. For example: The part number for a Cable Interface Module for the PMC-HPDI32A board would be CBLIFMOD-PMC-HPDI32A. Cable Interface modules are $195 each. Cables are sold separately. Note: If screw-clamp terminals are needed instead of the spring loaded terminal blocks, add a -1 to the end of the part number. For example the part number for a Cable Interface Module with screw-clamp terminals for the PMC-HPDI32A board would be CBLIFMOD-PMC-HPDI32A-1. Note: If screw-clamp terminals and DIN-Rail enclosure for the PMC-HPDI32A board would be CBLIFMOD-PMC-HPDI32A-1-1. The customize Interface Module will be require for the follow products. 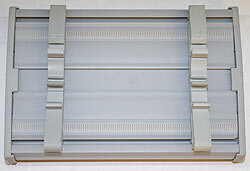 Please contact Sales for pricing on breakout boards with Din Rail Mounting at sales@generalstandards.com. Note: If screw-clamp terminals are needed instead of the spring loaded terminal blocks, add a -1 to the end of the part number. BNC connector box part numbers are BOX-BNC-NNN where NNN should be replaced with the model number of the board. For example, the part number for the BNC connector Box for the PCI66-16AO16-16 is BOX-BNC-PCI66-16AO16-16. All BNC Boxes contain isolated BNC connectors. Contact factory for pricing if you do not see a price below for a particular BNC Box. Contact factory for availability and minimum orders of BNC boxes. Includes the VREF ADJUST REFERENCE, OUTPUT STROBE READY, INPUT RETURN, etc in addition to the 22 signals (analog inputs, analog outputs, and digital I/O). $1245 each for BOX-BNC-PCI-24DSI32-32(Accommodate all signals including 32 input channels plus clock and sync for the PCI-24DSI32 board). BNC Rack Panel part numbers are PNL-BNC-QxNNN where Q is the quantity of boards and NNN is the model number of the board. 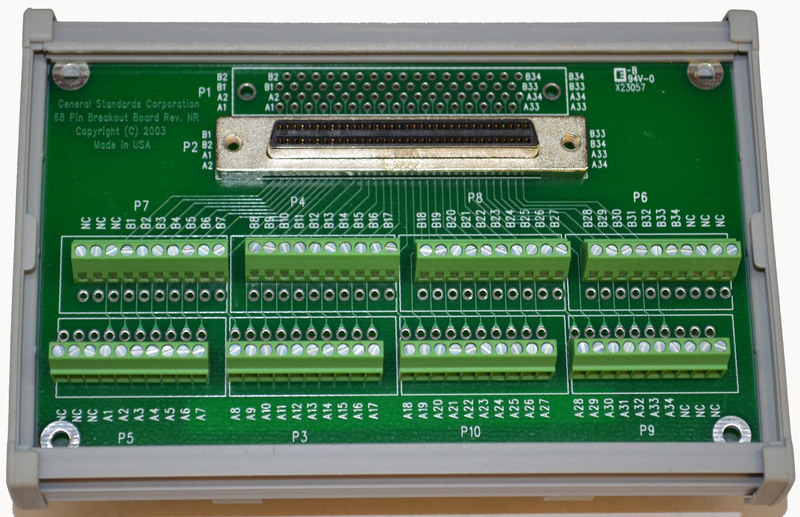 For example, the part number for the BNC rack panel for two PCI-16HSDI boards is PNL-BNC-2xPCI-16HSDI. 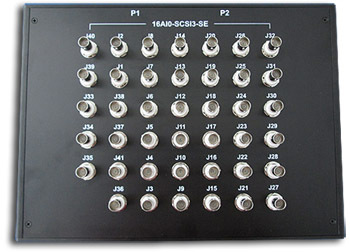 The BNC Rack Panel will have the same mating connector as the GSC board that will interface with the panel. 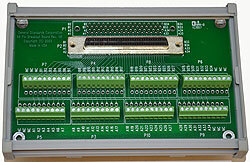 Each rack panel is basically composed of a variety of BNC pcb boards. There is one pcb board per GSC board. We also offer T.R.S. connectors for the Rack Panels. Contact factory for pricing if you do not see a price below for a particular BNC Rack Panel. Contact factory for availability and minimum orders of BNC Rack Panels. Cables are sold separately. Available in all form factors including PCI, cPCI, PC104-Plus and PMC. The 12-channel PMC-LVDS-CLOCK DRIVER Board provides a means of distributing LVDS signals among multiple boards, all from within a standard single-width PMC module. Optimized for flexibilty and performance, the board is ideal for multi-board synchronization. Also available, LVDS to TTL conversion or TTL to LVDS. 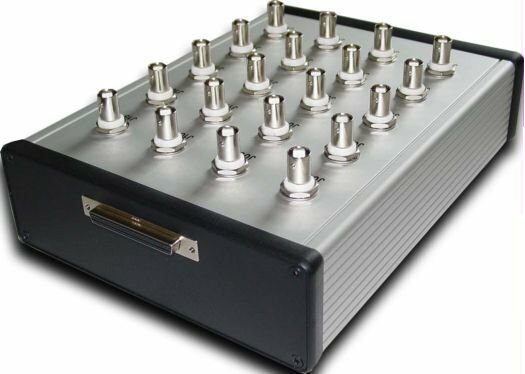 $1,500 each for the PNL-LVDS CLOCK DRIVER-32 ; This is a 32-channel LVDS Clock Driver Board; it provides a means of distributing LVDS signals among multiple boards (up to 16 boards). Rack panel hardware sold separately. Available in all form factors including PCI, cPCI, PC104-Plus and PMC. The PMC66-16AO16-CLK485TTL16 board provides RS485 and TTL I/O with on board clocks (resembling the General Standards PMC66-16AO16 Product) available. This product provides sixteen TTL Output channels divided into 4 banks of 4 channels each which can be configured to be driven by the on board clocks, one of the two available TTL inputs, or any of the eight available RS485 inputs.